A South Korean in the Toon? Like it. But aye, he's free, that's obviously the only reason we're signing him. Canny tragic like, not that I think he's bad, but ye nah. This c***'s going to make searching for earlier points I've made in threads canny problematic. I think he is a canny player, wanted us to go for him, good for the squad. Though it should be a signing to beef up the squad BUT we know that is unlikely. 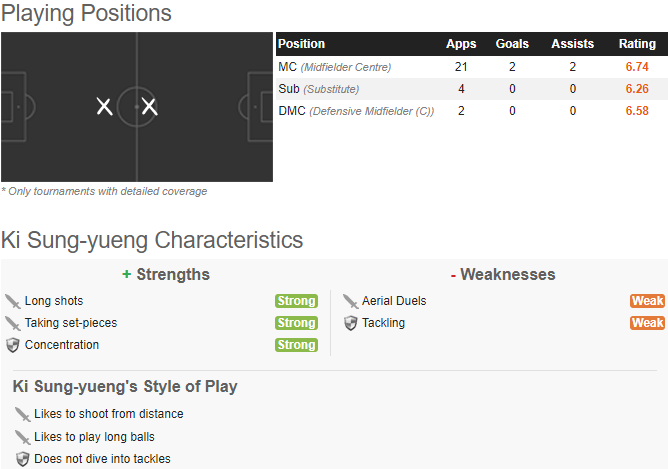 Is he the sort of player who will result in a large number of South Koreans suddenly following NUFC? Potential money spinner. I can't remember him playing vs Germany? Oldtype isn't enough for you? Don't know that much about him tbh. Saw him a couple of times at Swansea and he looked like one of those players who threatens to do good stuff but never really does. Hopefully he's better than that obviously. This is only a good signing if it frees up funds for Rafa. In an ideal world, us signing Ki might allow us to move onto other priorities. It could be another reason why we've been reluctant to spend. Makes the Sturaro (sp) links look a less likely. Be interested to hear Groo's verdict on him. The only thing I remember thinking was that he's alot bigger than you would expect a South Korean stereotype to be. What's his position? Is he a midfielder or defender? Utility type? Tidy player. Good with Celtic. Did his best for Swansea. Can’t see him starting ahead of either Diame or Shelvey so a weird one. Good squad cover I suppose. Centre mid. Good on the ball, likes a set piece and gets himself about the pitch well enough. Probably guilty of not fulfilling his potential throughout his career. Seems a wise move generally if Merino wants away and we're looking to tightly balance money. Rafa will get this lad playingn as well. Feel like he's a threat from set pieces. Anytime I watch Swansea, he wins headers from corners. Makes sense as I see he's 6'2. Page created in 0.586 seconds with 21 queries.